I thought I would take some time to revisit Learning Design. Our teaching lives are complex and time poor but it is important to stop sometimes and reflect back on things we have learnt and attempted to apply to our teaching practice. 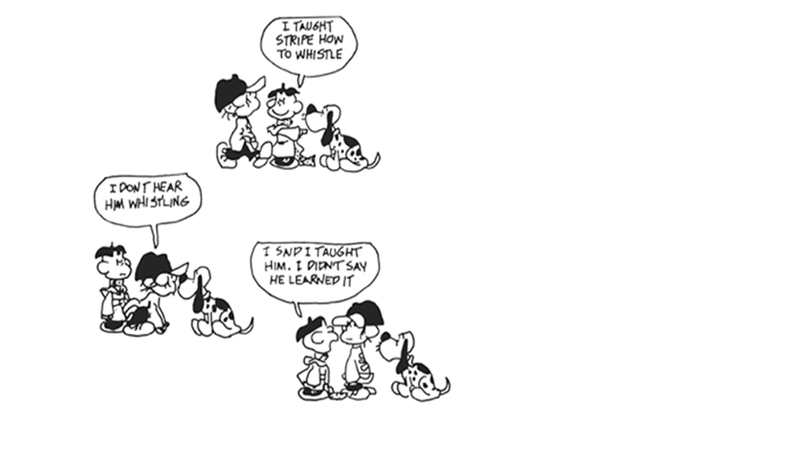 Learning Design is one of these things. We had the opportunity last year to look at Learning Design in some detail however this year we have not had the opportunity yet to revisit it. 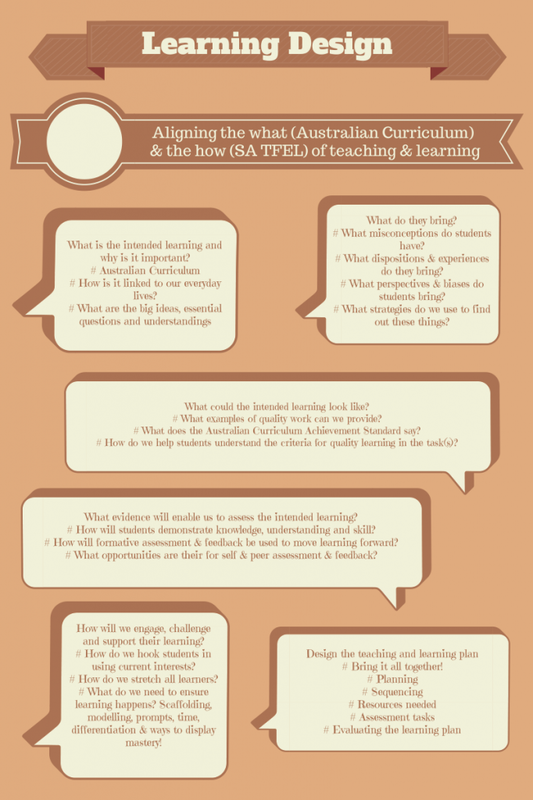 My personal attempt to go over the concept of Learning Design and how it applies to my planning, teaching and assessing was to create a set of posters which made me think about each of the aspects of Learning Design. The second purpose for creating these posters was so that I could share them with you. Today I am going to share the one I made which is an overview of all 6 areas of Learning Design. I will share the others with you over the coming weeks/months in the hope that you might reflect on where your strengths and weaknesses are in using Learning Design as a basis for the teaching and learning cycle. 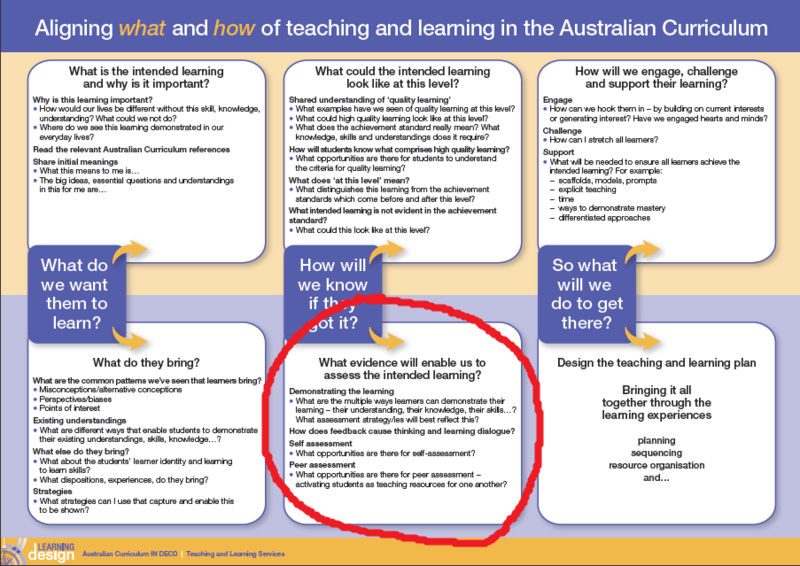 All information in the posters is taken from the Learning Design documents created by the DECD Teaching and Learning Services. Click here to visit the acleadersresource.sa.edu.au site. The fifth part of Learning Design is How will we engage, challenge and support their learning? “Children and young people do what they see adults enjoy”. If we show passion, enthusiasm and a genuine interest in what we are teaching students are more likely to respond in kind than if we turn up to class negative and disinterested. Our level of motivation is often reflected back to us through our students. • Can locate the value of their learning beyond school and wishes to prolong their learning beyond school hours. How many of us have students at the compliance end of the engagement continuum and how many do we have at the deep end? How we move students along this continuum requires us to continue to develop our pedagogy about how students learn, what engages them and how we will embed this in our day to day practice. When we expect that we have an impact on student achievement, we are right. When we expect that we are impotent, we are also right.” Is every student challenged to reach his/her personal best or just those who ‘do’ school well? (TFEL Framework pg 41). It is often easy to move support away from those that don’t seem to want to help themselves and give that extra time to someone who demonstrates enthusiasm for the learning. We have a professional responsibility to push, extend and support ALL students no matter how hard this might be at times. Can we engage, challenge and support every student all the time, maybe not. Should we aim to as often as is humanly possible, absolutely. • How can we stretch all learners? • What will be needed to ensure all learners achieve the intended learning? I would like to acknowledge that the information presented in this post and previous posts relating to Learning Design comes from the ‘Leaders Resource – Getting Started’ produced by Teaching and Learning Services DECD. 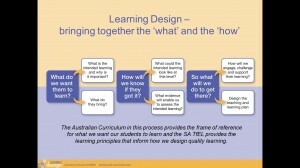 The fourth step in Learning Design is What evidence will enable us to assess the intended learning? Understanding if our students ‘have go it’ is crucial if we are going to accurately adjust our teaching and planning to suit the level of learning students are at. It is also vital if we are to accurately report to parents. To achieve this we need to assess students regularly. Dylan Wiliams suggests that “When implemented well, formative assessment can double the speed of students’ learning“. Just because we teach something does not mean students have learnt it! Below is a great little script that demonstrates what happens when we don’t use effective formative assessment methods. We await the answer to come. evidence that learning has occurred. ourselves that all is right with the world. test, or essay, and shake our heads in wonder. • Do our assessment practices provide our students with multiple ways to demonstrate their understanding? • What are the multiple ways learners can show their learning? 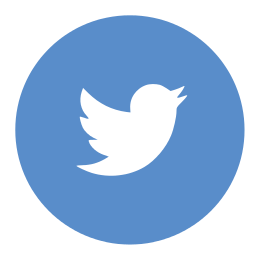 • Does the feedback cause thinking and learning dialogue? • What opportunities are there for self and peer assessment? 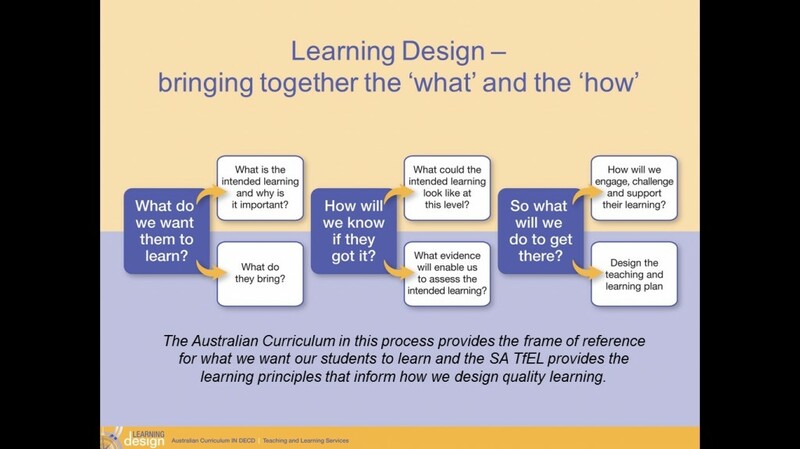 Step 3 in the Learning Design process is ‘What could the intended learning look like at this level?’ This statement relates directly to the Australian Curriculum content. Whether we have vertically grouped classes or not, we need to ensure that we look at the scope and sequence of our subject areas to see how the learning looks across the year levels. To download the scope and sequence charts for subjects click here. 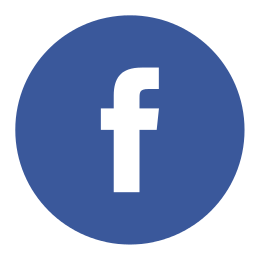 This link will take you to the Australian Curriculum website page that enables you to download the Scope and Sequence documents for all AC subject areas. What examples have we seen of high quality learning at this level? How will students know what is high quality learning? What does ‘at this level’ mean? What intended learning is not evident in the achievement standard? We are yet to work through some of these questions fully as teachers. There have already been some discussions around ‘moderation’ and looking at samples of work but we are yet to see samples of ‘high quality’ learning as part of this process (although they are supposed to be coming). The discussion around applying grades has also generated discussion and the term ‘at this level’ has teachers asking “How do I know the A I’m giving at this level is the same as the A being given by another teacher in another school? 2. Not all of the intended learning is evident in the Achievement Standards in the Australian Curriculum (so don’t just rely on these to set your tasks for students).